Mars Curiosity Rover Photographs Lizard on Mars? They’ve done it again! It appears that NASA and the scientists that work for our space agency have let another one slip through the cracks. Or maybe not? Maybe this is whistle-blowing in action or an attempt to slowly and purposefully release the information to the public? 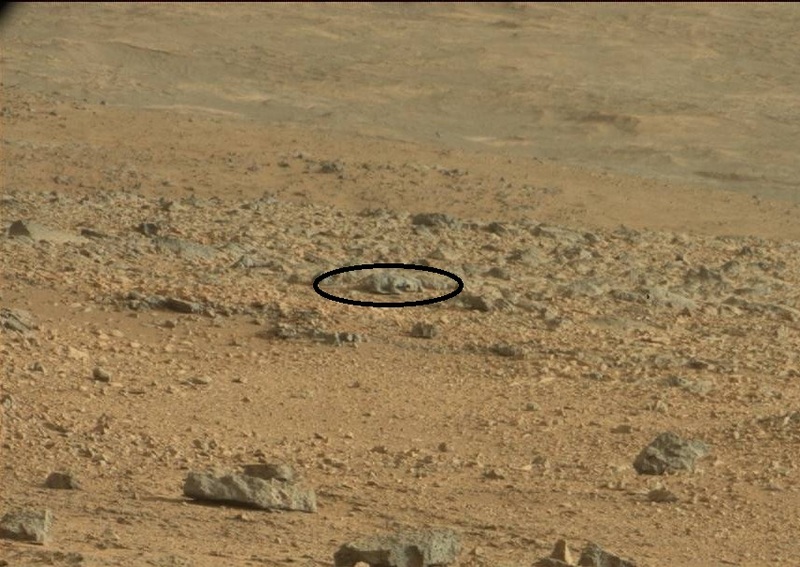 This time it was Mars Curiosity that photographed what appears to be a small lizard like animal on the Martian surface. The picture was discovered, according to a story that was written and posted by Dr. Michael Sala on Exoploitics.org., by a Japanese researcher in March of 2013. There was also a Youtube publication added on May 14, 2013. The evidence continues to pile up that Mars is not the dead and barren world that mainstream science would like us to believe. Pictures taken directly from NASA’s own servers have featured very clear images showing proof of vegetation, water, artificial structures, civilization, and even a custom built home on Mars. As usual, the comments attached to this story are filled with naysayers claiming the alleged animal is a rock formation or the product of our imaginations. Photo of Lizard on Mars? The truth be told, it is hard for the people that have been hired to marginalize these type of stories to do their jobs when the evidence comes directly from the NASA websites that are in the public domain. These photos cannot be the products of tampering from unauthorized individuals. They are supposed to be the real thing, directly from a foreign world. It appears to be only a matter of time before an announcement about full disclosure is made to the general public. Technically speaking, I believe this is a form of partial disclosure. The evidence is being regularly released in the photographic catalogs made available by our space agency. You just have to know how to access the proof that is already out there. Are we seeing drip theory at work here? Are they slowly releasing the information to us about life off world one drop at a time? What is your opinion on this subject?